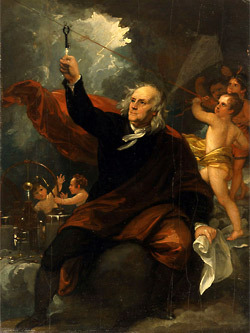 Benjamin Franklin's kite experiment, immortalized in this Benjamin West painting, was only the most famous episode in his prolific career as a citizen-scientist. In America, science and democracy were forged together from the start. Benjamin Franklin experimenting with electricity in a lightning storm is an iconic image. But Franklin was not alone. Many of the nation’s founding fathers were citizen scientists. Like Franklin, Thomas Jefferson, John Adams, James Madison, and George Washington were all avid students of the natural and physical world. Thomas Jefferson called “the tranquil pursuit of science” his “supreme delight.” He collected and classified fossils, was a prolific inventor and a student of mathematics, science, agriculture, and architecture. James Madison was even an elected member of the 'American Philosophical Society', America's oldest scientific society, founded in 1743. For one thing, because, as students of the Enlightenment, America’s founders were committed to unleashing the power of reason to advance knowledge and to build an effective and responsive government. They understood the benefits that could come when science and democracy worked together. And they exemplified a kind of bold, American pragmatism that put problem solving above partisanship and sought to base our government’s policies on the best available data and the most up-to-date understanding of the world. It is a lesson well worth remembering in today’s highly polarized political environment. 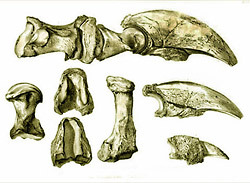 Thomas Jefferson's interest in paleontology led him to deliver a paper to the American Philosophical Society on these giant ground sloth bones found in a Virginia cave; the species was later named Megalonyx jeffersonii in his honor. America’s founders even used science to help them craft a strong system of democratic governance. John Adams, for instance, spoke of the “science of government.” In a debate with Benjamin Franklin in 1776, Adams invoked the principle of mechanical equilibrium to argue on behalf of his conception for our government’s system of checks and balances—designed, at least in part, to ensure policies based on verified, trustworthy evidence. But, most of all, the founders put science to work solving problems in our young democracy. What is important to remember is that, from the start of our nation, science has been seen as a useful tool not just for understanding the world, but for solving pressing problems. Franklin used his scientific understanding of electricity to invent the lightning rod—an eminently useful device that could prevent fires and benefit his fellow citizens, for example. In fact, science and democracy, working hand in hand, have proved a powerful combination that has helped our nation to prosper and thrive throughout our history. We need only think of how federal investments in medical research led to the successful containment of diseases such as smallpox and polio that killed and crippled our grandparents in large numbers. Or how science-based laws such as the Clean Air Act have saved hundreds of thousands of lives over the past four decades by effectively reducing deadly pollutants. There are scores of examples like these. President Theodore Roosevelt and naturalist John Muir at Yosemite National Park in 1906. Roosevelt was an energetic supporter of conservation and the national park system. It is not an exaggeration to say that science and democracy, when working together, have been one of the great American relationships – really one of the greatest the world has known—providing enormous rewards in health and welfare to Americans over much of our history and bearing technological fruits that have spread benefits around the world. A direct result of this interplay between science and democracy has been a set of precepts that have helped our nation prosper and endure. Concepts like transparency of methodology; in government, that translates to transparency in the decision-making process. The testing and re-testing of hypotheses, rigorous examination of ideas, review and critique by technically-qualified peers, free speech and open exchange, and protection against retaliation for one’s beliefs (or findings)—these are all healthy best practices in both science and governance. The scientific method requires that scientists take nothing for granted and rigorously test and scrutinize their findings. The approach frequently yields important advances in learning–by the time a brick has been added to the wall of knowledge it has been through a fiery kiln. And so, through vigorous debate, informed by the best-available scientific and technological understanding, can our democracy find the most promising approaches to the pressing problems we face today. Why a Center for Science and Democracy?